Congenital fibrinogen disorders include afibrinogenemia or hypofibrinogenemia in which there are absent or low plasma fibrinogen antigen levels and dysfibrinogenemia in which there are normal or reduced antigen levels associated with disproportionately low functional activity. 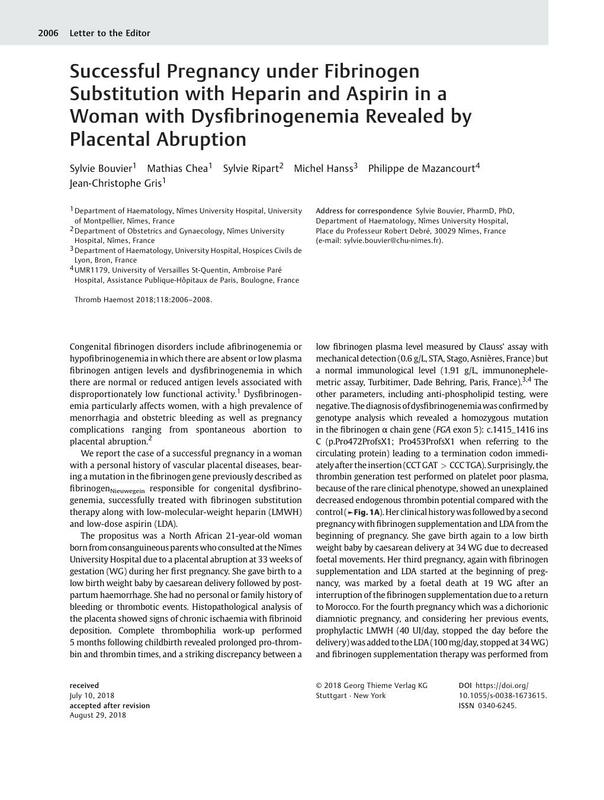 Dysfibrinogenemia particularly affects women, with a high prevalence of menorrhagia and obstetric bleeding as well as pregnancy complications ranging from spontaneous abortion to placental abruption. We report the case of a successful pregnancy in a woman with a personal history of vascular placental diseases, bearing a mutation in the fibrinogen gene previously described as fibrinogenNieuwegein responsible for congenital dysfibrinogenemia, successfully treated with fibrinogen substitution therapy along with low-molecular-weight heparin (LMWH) and low-dose aspirin (LDA). The propositus was a North African 21-year-old woman born from consanguineous parents who consulted at the Nîmes University Hospital due to a placental abruption at 33 weeks of gestation (WG) during her first pregnancy. She gave birth to a low birth weight baby by caesarean delivery followed by post-partum haemorrhage. She had no personal or family history of bleeding or thrombotic events. Histopathological analysis of the placenta showed signs of chronic ischaemia with fibrinoid deposition. Complete thrombophilia work-up performed 5 months following childbirth revealed prolonged pro-thrombin and thrombin times, and a striking discrepancy between a low fibrinogen plasma level measured by Clauss' assay with mechanical detection (0.6 g/L, STA, Stago, Asnières, France) but a normal immunological level (1.91 g/L, immunonephelemetric assay, Turbitimer, Dade Behring, Paris, France). The other parameters, including anti-phospholipid testing, were negative. The diagnosis of dysfibrinogenemia was confirmed by genotype analysis which revealed a homozygous mutation in the fibrinogen α chain gene (FGA exon 5): c.1415_1416 ins C (p.Pro472ProfsX1; Pro453ProfsX1 when referring to the circulating protein) leading to a termination codon immediately after the insertion (CCT GAT > CCC TGA). Surprisingly, the thrombin generation test performed on platelet poor plasma, because of the rare clinical phenotype, showed an unexplained decreased endogenous thrombin potential compared with the control ([Fig. 1A]). Her clinical history was followed by a second pregnancy with fibrinogen supplementation and LDA from the beginning of pregnancy. She gave birth again to a low birth weight baby by caesarean delivery at 34 WG due to decreased foetal movements. Her third pregnancy, again with fibrinogen supplementation and LDA started at the beginning of pregnancy, was marked by a foetal death at 19 WG after an interruption of the fibrinogen supplementation due to a return to Morocco. For the fourth pregnancy which was a dichorionic diamniotic pregnancy, and considering her previous events, prophylactic LMWH (40 UI/day, stopped the day before the delivery) was added to the LDA (100 mg/day, stopped at 34 WG) and fibrinogen supplementation therapy was performed from the beginning of pregnancy. Thromboprophylaxis was continued for the 6 weeks after giving birth. This fourth pregnancy was normal with a programmed caesarean delivery at 34 WG + 3 days. She had a fibrinogen perfusion before the general anaesthesia with the last one given 3 days after delivery. The fibrinogen supplementation consisted in 3 g of fibrinogen per week (Clottafact, LFB, Courtaboeuf, France) infused over 30 to 60 minutes. A quantification of functional fibrinogen was regularly performed ([Fig. 1B]). Fig. 1 The thrombin generation test, 5 months after the first pregnancy (A), and fibrinogen follow-up during the last pregnancy of the patient, Clauss method (B). For A, the thrombin generation test was performed on a calibrated automated thrombogram (Thrombinoscope bv, Maastricht, The Netherlands, and Stago, Asnières, France). Measurements were taken in a 96-well plate using a fluorometer (Fluoroskan, Thermo Scientific, Waltham, Massachusetts, United States) on platelet poor plasma with tissue factor (5 pM), phospholipids (4 µM), a thrombin calibrator and a fluorogenic substrate (FluCa-Kit). The thrombogram parameters are as follows: lag time patient: 2.78 minutes (control = 2.78 minutes); peak height patient: 370.33 nM (control = 371.32 nM); time to peak patient: 4.44 minutes (control = 5.0 minutes); endogenous thrombin potential (ETP) patient: 1,092 nM/min (control: 1,894 nM/min). For B, each dot represents a blood sample. The dotted line represents the 1 g.L−1 threshold. The arrows represent each fibrinogen perfusion which consisted in 3 g of fibrinogen per week. Quantification of fibrinogen was regularly performed. Congenital dysfibrinogenemia are rare coagulation disorders. Over half of patients experience no clinical complications; however, bleeding occurs in around 25%, and thrombosis has been reported in approximately 20% of patients. Small deletions, insertions in all three fibrinogen genes as well as splicing variants have been described but only a minority cause symptoms. These variants can affect fibrinogen functions, fibrin polymerization, fibrinopeptide cleavage and/or interaction at the D–D interface or between the outer D regions and the E central node. Dysfibrinogenemia are mostly found as heterozygous missense variants. Frameshift variants represent 21% of genetic abnormalities in the FGA gene. The mutation seen in this patient was first described in 2001 by Collen et al in a young man without any thromboembolic complications nor bleedings. The introduction of a stop codon at position 454 results in the deletion of the carboxyl-terminal segment Aα 454–610 containing an important arginine-glycine-aspartic acid (RGD) sequence necessary for fibrinogen interaction with endothelial cells and platelets. The molecular abnormalities of fibrinogenNieuwegein lead to delayed clotting and the formation of an altered fibrin structure with a denser fibrin network. A second case of fibrinogenNieuwegein described in 2018 in a 2-week-old boy with a thrombosis of the right internal cerebral vein and an intraventricular haemorrhage, showed a prolonged tissue plasminogen activator-induced clot lysis time. This boy was the first child from non-consanguineous Moroccan parents, with uneventful pregnancy and delivery. Fibrinogen is essential to support cytotrophoblast invasion and development during pregnancy and obstetrical poor outcomes are frequent in patients with dysfibrinogenemia; thus, pregnancy care requires a multi-disciplinary approach. Dysfibrinogenemia is a challenging disorder, and there are no guidelines on treatment for pregnant patients with dysfibrinogenemia. Fibrinogen replacement therapy is effective in treating bleeding episodes in congenital fibrinogen disorders. A few cases of dysfibrinogenemia have already been described, which show that only patients with fibrinogen supplementation developed normal pregnancy. Without fibrinogen replacement, women experienced miscarriages, foetal losses and placental abruptions. Fibrinogen concentrates are generally considered as the treatment of choice due to their high safety, rapid onset of action, dosing flexibility, small infusion and ease of administration. The plasma half-life of fibrinogen is relatively long, enabling weekly prophylaxis with fibrinogen concentrates. The frequency and dose should be adjusted to maintain a level > 1.0 g/L.15–16 In such cases, thromboprophylaxis with LMWH could be prescribed if personal or family history of thrombosis is present or in post-partum. Combination with LDA has never been documented in the literature. In conclusion, a treatment combining fibrinogen substitution and anti-thrombotics resulted in a favourable maternal and neonate outcome despite a personal history of severe obstetrical complications. The link between normal fibrinogen and pregnancy prognosis is reinforced by the foetal death which occurred after an unfortunate interruption of fibrinogen substitution, and the negative thrombophilia assessment. In such rare patients, the multi-disciplinary description of optimal obstetrical approaches is warranted, with an urgent need for formulating treatment guidelines to improve pregnancy management and outcome.